Everyone knows successful people. How is it that some individuals always seem to be selected for great assignments at work, seem to advance more quickly, and...well...just seem happier? In this book, a seasoned executive recruiter shares his observations about the 25 behaviors outrageously successful people share in common. 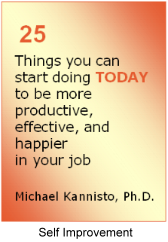 Things YOU can start doing today to be successful too. This book recognizes self-reflection as the first step to self-improvement. It is the first move to understanding what is important to you. 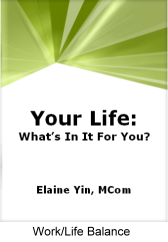 Exercises and tips are provided to assist you in discovering Your "Perfect" Life and Your Goals. You will focus and set goals in five areas: family, social and leisure, business and career, financial, and self. Tips and guidelines are given that will help you avoid or overcome the roadblocks, reach your goals, and realize the life that's right for you. REMEMBER things you read that are important to business and social life style. REMEMBER important verbal messages that you want and need to recall. REMEMBER typically hard- to-remember facts and figures through an ingenious system of Mnemonics, an artificial memory system. REMEMBER abstract bits of information, including numbers, through Mnemonics. 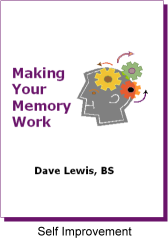 REMEMBER names--the universal memory nemesis--by using proven Mnemonic and practical methodology. Here's the thing about time management...there is no "one size fits all." It's personal. Managing your time actually means managing yourself within time, and that means knowing some things about yourself. Energy, Task, and Time Management is chock full of exercises and examples that help you learn some things about yourself and how to use that knowledge to make your use of time more productive. Energy, Task, and Time Management begins by introducing you to your personal energy cycle - your daily rhythm that cycles you through periods of "being ready for anything" to "yawn" and everything in between. Then guides you through the process of analyzing your daily tasks to determine their relative demands on your energy. Which tasks require concentration and focus? Which are routine? By synchronizing the levels of your energy throughout the day with the demands of your tasks, you not only accomplish in less time, but you also improve the quality of what you get done, and in turn, the quality of your life. 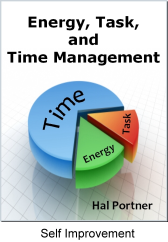 Energy, Task, and Time Management clearly illustrates this principal and guides you through the process. How you manage yourself within time...what you decide to do, when you decide to do it, and how you manage the roadblocks you may encounter on the way...that is what time management is all about. And that is what this book is all about. If you are like many people in today's fast paced, always connected world, you are searching for practical ways to achieve work/life harmony. 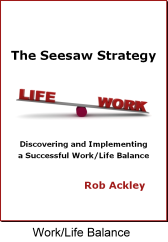 In The Seesaw Strategy, the author presents a fresh approach for balancing both sides of the work/life equation. Five guiding principles are introduced that when adopted will help you navigate the choppy waters of life while remaining in control. Through self-assessments, exercises, and case studies you will develop a concrete, executable action plan that will help you meet your individual needs and achieve your work/life goals. It probably started with the electric washing machine and dryer. The process then evolved to the dishwasher, remote devices, and finally the computer. Technologies and other innovations have allowed an increasing amount of living and working to be done while sitting. The result is that a growing number of people spend most of their waking hours sitting. Some would make the argument that a "sit-down" job is preferable. "Sitting/thinking" work is preferable to "standing/moving" work. The tendency toward efficiency of motion produces a culture whose citizens minimize physical effort whenever possible. Sitting is an example of minimizing effort. While this may reinforce the human tendency to avoid effort and maximize a leisurely perspective, there are both physical and psychological consequences. 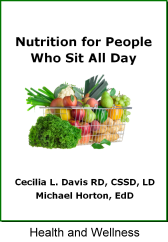 This book addresses those consequences in part by calling attention to what happens in the body day by day from sitting and by providing nutrition guidance to minimize those consequences. This book is written by a teacher who has dedicated his life to expanding the mental reach of his students by exploring the process of learning. The fascination of learning comes from the haunting question asked by the theorist Jean Piaget who wondered how children learn. With the recent discoveries of how the brain functions, new understandings of the learning process have revolutionized our approach to learning and have put within our grasp the biological underpinnings of mental activity. 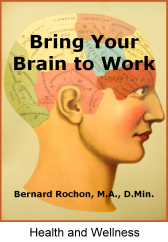 This book briefly outlines the structure of the brain and reflects on why exercise, sleep, and coping with stress are all essential to healthy brain development and care. The context of this book is set in the workplace. Learning is a life-long endeavor. 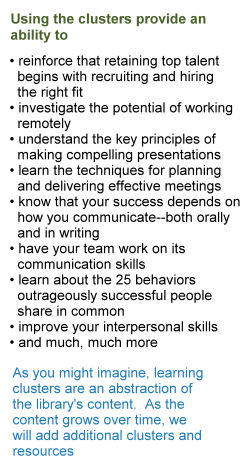 It is in the workplace that learning flourishes into creative productivity. The employee is the greatest asset an organization has. Employees with sharp, alert minds are basically using their sharp, alert brains to contribute to the growth of their companies. Employers must appreciate employees as valued assets of human capital far beyond the worth of machines and real estate. This book will offer the reader an opportunity to assess his or her thinking capacity by taking the Hartman Value Profile. This mind scan will introduce the reader to a way of thinking that will revolutionize his outlook on the world.